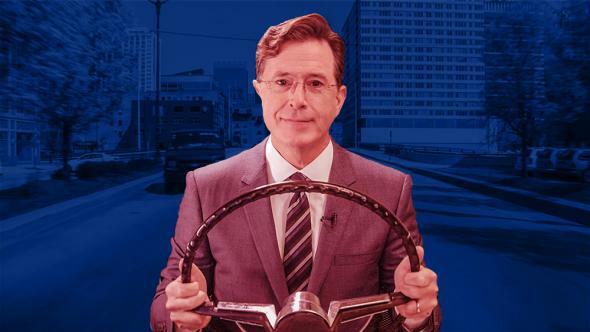 The Late Show With Stephen Colbert has become the best late-night show on TV. Colbert on The Late Show With Stephen Colbert. Photo illustration by Slate. Courtesy of CBS Broadcasting Inc.
Three months into Stephen Colbert’s tenure as the host of CBS’s The Late Show, no one in late night looks happier to be there. At the beginning of each episode, Colbert bounds onto the stage and surveys the applauding audience—which is often chanting “Steph-en, Steph-en,” a holdover from his tenure as a demagogue pundit on The Colbert Report—and his eyes seem to flood with feelings. For a few seconds he looks overcome with the magnitude of his good fortune. Before The Late Show With Stephen Colbert premiered in September, the pressing question was just how Colbert would fare without the partisan blowhard persona he had inhabited for nearly a decade on The Colbert Report: Who is Stephen Colbert when he’s not playing Stephen Colbert? But the transition between Colberts has been remarkably smooth. The new, real Colbert has inherited many of the old, fabricated Colbert’s qualities—including quickness, faux pomposity, and an interest in politics—but has traded in his shtick for sincerity. That sincerity is apparent not just in the obvious joy with which Colbert takes to the stage each night. It’s in the time—often too much time—he gives to celebrities to explain their charitable projects. It was in his first viral segment, an emotional conversation with Vice President Joe Biden. It’s in the frequency with which he mentions his own faith as a practicing Catholic, from comedic sketches that take place in confessionals to a testy exchange with atheist Bill Maher about religion. It was in an on-camera Thanksgiving dinner, in which all assembled guests, including Gloria Estefan and French chef Daniel Boulud, declared what they were grateful for. It’s in every aspect of the show, except, surprisingly, its politics. Colbert, like his fellow Daily Show veteran John Oliver, has retrofitted The Daily Show’s house style for new digs. Instead of the classic, straight-faced joke-punchline structure, both hosts favor the comic argument: a harangue supported by images and video in which the host’s emotions, asides, accents, and consternation are as much a part of the humor as the wordplay and mount to a sustained point. Oliver’s widely acclaimed, regularly viral, episode-long arguments about the ills of everything from mass shootings to the prison industrial complex to televangelism are longer, more impassioned, and more pointed than Colbert’s, who is free neither from commercials nor the mandate to be broad. But the two still have more in common with each other than they do with Colbert’s rivals: the Jimmys, Fallon and Kimmel, who have both juiced the opening monologue quite a bit but still start every episode of their shows standing onstage and telling topical jokes. Colbert also begins each show standing onstage, but he rushes to sit, running through a joke or two before previewing the night’s guests and throwing to the credit sequence. Afterward, he can be found safely ensconced behind his desk, ready, more often than not, to talk politics. Colbert is savvier about politics and all its absurdities than anyone on late night. As CBS CEO Les Moonves has said many times, Colbert’s facility with politics, especially in the midst of a presidential election, is part of his upside. But the Catch-22 of Colbert’s ability is that although our polarized politics have rarely been so ripe for comedy, political comedy has rarely been so polarizing. A hilarious and well-informed political maven has no dearth of material—and no dearth of chances to alienate vast segments of his potential audience. The Hollywood Reporter recently commissioned a study about the state of late night that found that Fallon is “king” in the ratings and that Republicans don’t much like Colbert. (And yes, Republicans do watch late night.) Some 33 percent of Kimmel’s audience and 31 percent of Fallon’s audience are Republicans, compared with only 17 percent of Colbert’s. This is not a particularly troublesome bit of information for Colbert. CBS knew whom they were hiring. Late-night hosts take a long time to find their footing and their audience. Colbert is already doing much better numbers than David Letterman was, and though he may be trailing Fallon, he’s neck and neck with Kimmel. And—if this counts for anything—his show is good. Colbert’s feints in a more politically neutral direction often tie him up in the contortions that his uber-conservative persona did, too. He is no longer playing a character, but it is when discussing politics that he seems most like the old Colbert—a man wielding his considerable intelligence to convey exactly what he means without quite saying it. Consider a segment a few weeks ago in which Colbert said, “The majority of cops are good people … but black people aren’t imagining this stuff. Both sides have a good point. As a host of a late night show, it’s my responsibility to take a side. So let me just take a moment here to say: I agree with how you feel. You know who you are. I feel strongly about that.” It is hard, given Colbert’s history, to believe the ingenuousness of such disingenuousness. Colbert’s riffs remain incisive and funny, but they are the least heartfelt aspect of an otherwise surprisingly heartfelt Late Show. Colbert has left the calls to consciousness and righteous moral indignation to John Oliver, content to giddily make fun of Donald Trump and openly quash Trump’s more scathing sentiments. In the Thanksgiving episode, Colbert had a zany, hilarious, seemingly apolitical bit about the decision to stop running medical tests on chimpanzees, in which he freed Zobo, The Late Show’s very own joke-testing ape. Colbert cut to a pretaped sketch detailing the “joke-testing process,” in which a writer in a lab coat ran the following joke by Zobo: “Sen. Ted Cruz has said an atheist isn’t fit to be president. Which is ironic because if he’s elected there will be a lot more people doubting God’s existence.” Zobo shrugged and then held up a “Too political” sign. Even trying to restrain himself, Colbert will be too liberal for most conservatives. If The Late Show’s politics are less earnest than those of Last Week Tonight, they are much more so than those of the Jimmys, for whom a montage of Trump saying the word peanuts over and over counts as political coverage. Colbert and Kimmel, who share a certain Letterman-infused skepticism, both trail Fallon in the ratings. If you watch Fallon’s Tonight Show, it is easy to see why. It’s comfortingly escapist, sweetly entertaining, a good time that’s never judgmental or sour, edgy or incisive. It won’t raise your blood pressure by discussing partisan issues or showing kids being robbed of their Halloween candy. Fallon affably rolls through his show on a kind of pleasant autopilot, the highlight of each episode his genuinely remarkable ability to put celebrities at their ease. He fills out the rest of each show with some toothless goofing around elevated by the Roots. (Kimmel, who has been on the air longer than Fallon, seems fresher. Lucky for Colbert, acerbity may be a more natural mode to maintain for years than enthusiasm.) Fallon is years into his gig and understandably not trying as hard as newbie Colbert, but his Little Mr. Sunshine act is comforting and loose, with none of Colbert’s intensity. And that intensity is intrinsic to Colbert, whether he’s playing demagogue or late-night host. It’s easy to understand why people might prefer to fall asleep to Fallon every night: Colbert might keep you up.